At the Minneapolis Institute of Arts, iPads are going on tours with the express purpose of enabling tour guides to use multimedia to enhance their tours. The program was actually a research project, and below is a down and dirty list of the things we learned throughout the project. At the beginning of the project, before we even had iPads, the tour guides were polled about what they’d like to use on iPads. The poll results were just what we expected, the guides named photographs, maps and videos in their wish list. In addition, a core group of four guides was recruited to pilot the program, and they sat in on several of our early meetings. Loading up the iPads with stuff was easy, organizing the stuff on the iPads presented a different problem. It quickly became apparent that there was a lot of stuff and no one way to have it all live in one place. In the end, we used iTunes to organize music and movies in playlists, the photo program on the iPad to organize photos into relevant piles, and a link on the iPad to Google maps. Promising (but not perfect) apps have since been developed, FileApp and Best Album are two that allow you to put everything in one place. We devised two trainings for tour guides interested in using iPads on their tours. The first was at a local Apple store in their briefing room, with Apple staff doing the training. It was focused purely on helping people understand how the iPad works, and was invaluable because, with Apple’s help, everyone got an iPad to use during the training. The second session was at the museum, and focused on how media was organized on the iPad as well as best practices based on trial tours done by a small group of museum staff and tour guides. Apple staff attended this training as well, to help out as people played on the museum’s iPads. During the trial period, we noted how comfortable people were holding the iPad and concluded that some kind of case would be ideal. We recommended a sleeve with a spot in back you could slip your hand through, Like the Griffin AirStrap. Since we conducted the training, a similar strap called Sleeve 360 has come out. The speakers on the iPad were fine for most situations but a little under powered for a noisy gallery filled with visitors. We were using the original iPads, the iPad2 has better speakers. In any case, many tours guides found it easy to shut off the volume and narrate videos themselves. When the program rolled out at the museum, many excited tour guides went out and bought their own iPads. This presented a problem since iPads can only be synced with one computer, and all the media assembled by the museum was on a laptop docking station in the tour guide lounge. The museum has no policy against a tour guide using their own iPad, but claims no responsibility for a personal iPad used on tours. Tour guides at the museum are sharing resources with each other in a way that was never possible before the iPad went on tours. Tour guides are also using works of art on their tours that they haven’t used before because multimedia has enabled new avenues for interpretation. The researchers assumed that videos would be the most popular among both tour guides and visitors, but it turns out that high resolution photographs of objects that tour guides can zoom in on are far more powerful. For the first time, visitors can see the filigree on the tiny golden lion in a case in the Islamic gallery. Among visitors, the ability to whip out their smart phones and look things up on the fly has become the norm, especially since galleries at the museum have become Wifi enabled. Now that ability is extended to tour guides, and everyone on the tour benefits from sharing the content. If a museum has video monitors installed in galleries, tour guides can send content from the iPad directly to the monitor as long as the monitor is hooked up to AppleTV (a little box that costs $99). This capability solves the occasional speaker problem and has the potential to wow visitors with even larger displays. Once existing multimedia for iPad tours has been exhausted, will people begin designing multimedia specifically for iPad tours? We hope so. And with the iPad2’s FaceTime application, it’s possible to make a video call to connect a tour group with an artist, curator, or anyone in real time and space. 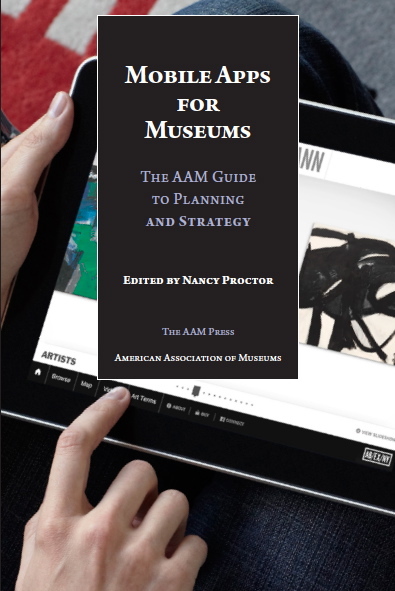 We’ve written a chapter in the upcoming Mobile Apps for Museums: The AAM Guide to Planning and Strategy, which will be published on May 23, 2011 as an e-book through the AAM Bookstore at www.aam-us.org The book will be available in paper sometime after May 23. And of course leave your questions and comments here, we’d be happy to continue the conversation. 2 Responses to "iPads on Tour"